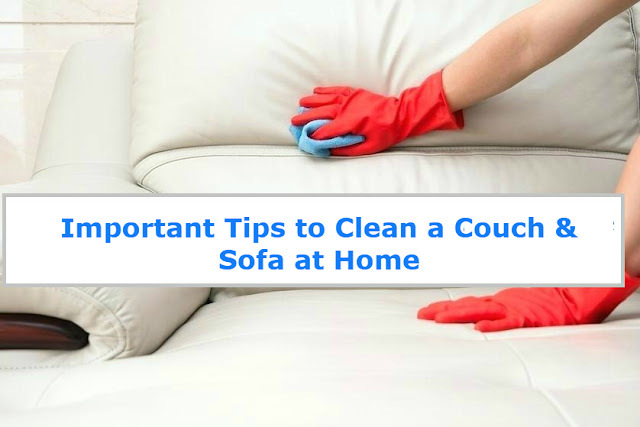 It is obvious fact that sofas or couch get dirty as the dust particles find their way through cracks, drinks also get spilled thus it is inevitable fact that there could be many factors that can make your sofas to look untidy. Most of the time we feel that cleaning the sofas or couches is quite difficult to process that should be performed only by the professional Sofa Cleaners in Dandenong but we can also clean our sofas at home. However, the cleaning process for different sofas can be different but by having some patience and by utilizing some efforts and time we could have clean sofas at home. Sofa or Couch Cleaning is a not a difficult process as with following tips you can easily clean your sofa at home. Let us know about different cleaning approaches. • For regular cleaning, you can clean your sofa with a moist rag but for proper and complete cleaning you can go for the gentle leather cleaner which can be easily bought from supermarkets and with this solution you can clean your sofa. • If you do not want to buy the cleaner from market then for effective cleaning you can use white vinegar and can make your sofa cleaner. You can mix the white vinegar with equal amount of water and then can clean your sofa. • Instead of using cleaner directly on the sofa you can dip the rag into the solution and can clean your sofa with that rag. • Then with a dry rag you should clean your sofa properly. • Conditioning of your sofa is also important as after cleaning the sofa you can take the solution of vinegar mixed with two parts of linseed and flax oil and then rub your sofa with this solution and let it dry overnight and then in the morning clean the sofa with a fresh and dry rag. At the end of this cleaning and conditioning process, you will have clean, brand new shiny sofa. Fabric sofas look really attractive and great but cleaning these sofas is not an easy task. Let us have a look at some cleaning tips for fabric sofa. • Initially, you must read the instructions mentioned on the sofa given by the manufacturer before cleaning the sofa at home. • Then you can use a vacuum cleaner to clean your sofa. • If you want to remove the stain from your fabric sofa then baking soda is the best option. • After cleaning your sofa with a dry rag just sprinkle the baking soda on your sofa even you can sprinkle the mixture of dry carpet cleaner and baking soda. • In the next step use vacuum with brush attachment to clean up the sofa. It is the best way to remove the stain from your sofa otherwise fabric cleaning solution can also be used for regular cleaning of your sofa. Upholstery Steam Cleaning in Dandenong is also very popular for cleaning the fabric sofa but it is applicable only for the sofas that are W or WS marked means on the sofas that can be cleaned with water or water-solvent solution as per instructions of the manufacturers. • Then use the streamer to stream your sofa completely. • After that just point a fan on your sofa and let t dry completely. • When the sofa get dried then again use a vacuum to clean it. After the stream cleaning, you could have deeply cleaned sofa with a new, fresh and shiny look. Thus all the steps of cleaning a sofa or couch are quite easy but can be bit time-consuming. Thus by utilizing some efforts and time, you could have properly clean and hygienic sofa to sit and beautify your living area. If you are unable to remove some stains like of red wine from your sofa then you can consult with the professionals and get cleaned your sofa from the professional sofa cleaners only.